The lovely ladies at Author 2 Author have nominated Writer Beware Blogs! for the I Love Your Blog Award. I've fulfilled Rules 1 and 2, but after some thought, I'm not going to proceed farther. I suppose that awards like this can be classified as memes, but to me they seem very much like chain letters, in that they impose an obligation on the nominee and force the nominee to pass that obligation on to others. I could certainly think of seven great blogs to nominate--see the sidebar--but I'm not comfortable with asking them to do something just because I think they're cool. So I'll just confine myself to saying thanks to Lisa, Kristina, Deena, Emily, and Kate for the nomination. 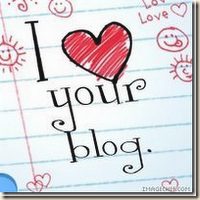 I'm thrilled you guys like the blog, and I love the way you describe us--"like the writer's version of Law and Order." Hmmm. Now which L&O character do I want to be?